(Berklee Press). Berklee expert speaks on how to market and distribute your songs and group. Sell more music! 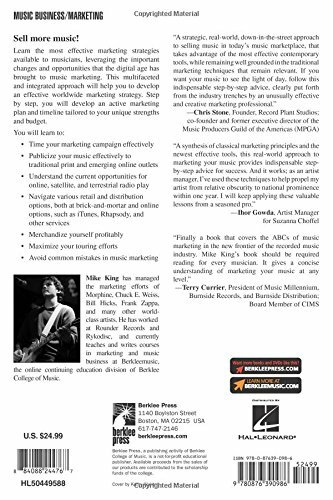 Learn the most effective marketing strategies available to musicians, leveraging the important changes and opportunities that the digital age has brought to music marketing. This multifaceted and integrated approach will help you to develop an effective worldwide marketing strategy. Step by step, you will develop an active marketing plan and timeline tailored to your unique strengths and budget. You will learn to time your marketing campaign effectively, publicize your music to traditional print outlets and emerging online opportunities, understand the current opportunities for online, satellite, and terrestrial radio play as well as navigate various retail and distribution options, both at brick-and-mortar and online options, such as iTunes, Rhapsody, and other services.